The past 12 months in the world of sports have seen plenty of interesting stories. Montreal sports teams can’t find a way to win, a king found a new home while a prince emerged in Russia, and we saw sports can be fun sometimes. 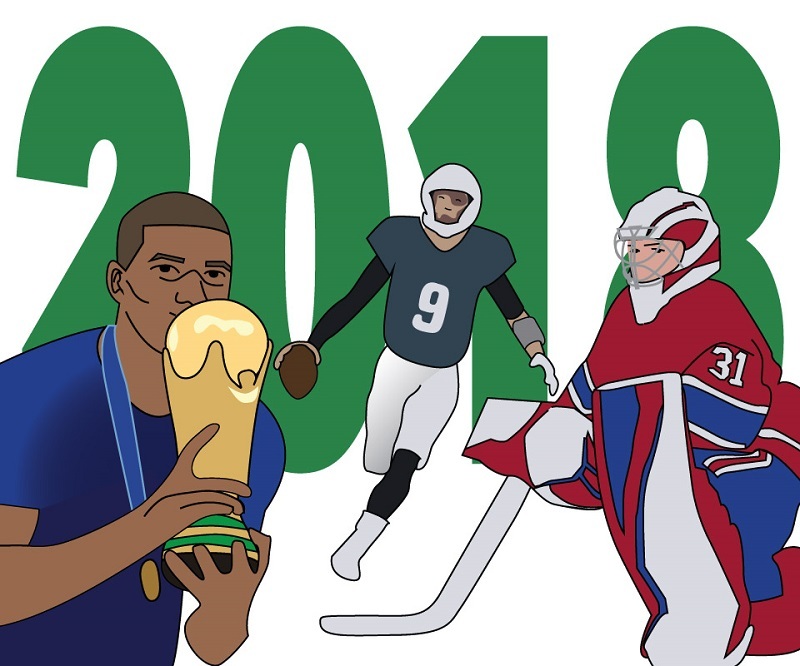 Here is The Concordian’s 2018 sports year in review. Since 1995, at least one of the Montreal Canadiens, Alouettes or Impact have qualified for the postseason in any given year. For the first time since then, none of Montreal’s men’s professional sports teams made the playoffs in their respective leagues. The Canadiens finished the 2017-18 season with a 29-40-13 record, missing out on the playoffs for the second time in three seasons. Goalie Carey Price did not look like the MVP goalie he was in 2015, posting a 12-19-9 record with an 89.5 save percentage and 3.22 goals-against average in 2018. The Canadiens also traded captain Max Pacioretty, which originally did not look so good, but things are improving for the team. The Impact and Alouettes both had new head coaches this year, going 14-16-4 and 5-13 in their respective seasons. You can’t forget the Canadiennes of the Canadian Women’s Hockey League, who finished first with a 22-5-1 record. They were upset by the Markham Thunder in the first round of the playoffs, with a 2-0 series sweep. So really, no professional team in this city won a playoff game in 2018.
Who says there can’t be fun in the pressure-filled world of professional sports? The Philadelphia Eagles certainly had fun at the Super Bowl in February. Up 15-12 in the second quarter, with a fourth down on the one-yard line against the New England Patriots, the Eagles ran a trick play to throw a touchdown pass to quarterback Nick Foles. The play has become known as “The Philly Special” and it’s probably one of the boldest calls ever made in a championship game. The Eagles had perfect execution on the play. Foles fooled the Patriots’s defence by pretending to bark out orders to his linemen, before scrambling off to the side for the open catch. The FIFA World Cup is meant for players to shine, and French forward Kylian Mbappé did exactly that. He helped France win the World Cup, and tied in second for most goals scored at the tournament with four. He made his mark in the round of 16 match against Argentina, where he scored two goals four minutes apart in the win, including the game-winning goal. Mbappé’s strength and speed showed the world he’s the next soccer star. The 19-year-old won the tournament’s best youngest player award, and he also completed his permanent transfer to Paris Saint-Germain, worth over CAD$250 million. What a year for Mbappé. After spending four seasons back with the Cleveland Cavaliers, basketball superstar LeBron James decided to join the L.A. Lakers. The Lakers finished last season with a 35-47 record, but with the help of James, they’ve instantly become a much better team. James’s exit from Cleveland shifted powers in the league, putting the stars and best teams, like Steph Curry and the Golden State Warriors, in the Western Conference. The Toronto Raptors also traded fan-favourite DeMar DeRozan for Kawhi Leonard, becoming the beasts of the Eastern Conference in the off-season.